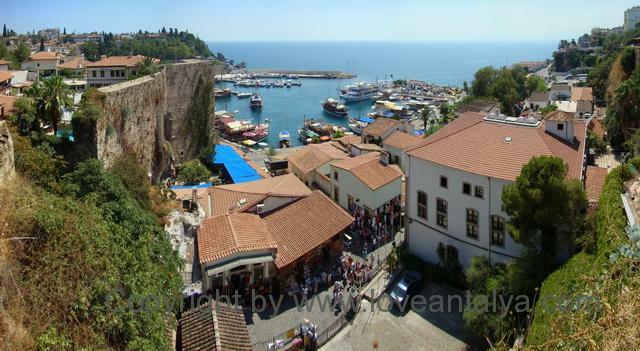 Antalya is for me as a huge city with many neighborhoods, more or less interesting attractions, museums etc. and above all many options. Antalya is a city that has expanded dramatically the last 30 years and therefore the city has added layer by layer – both up in the form of several towers and outward in the form of a significantly enlarged area. In lighter poetic terms, one can say that there is a heart, a place where the city originates from. 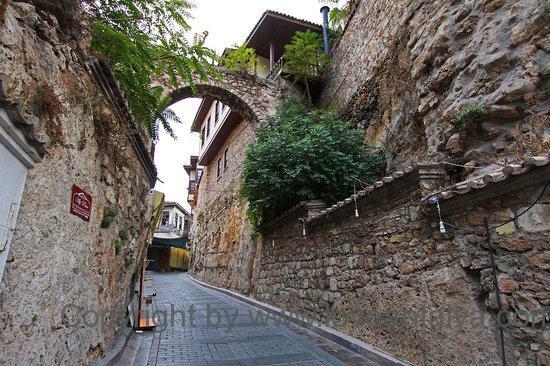 This heart is Kaleici – Antalya’s old town. When you are there, it makes sense. Kaleici is the innermost center, which – as in many other ancient cities – revolves around the harbor. Then, there is built outward. The old neighborhoods within the city walls oozes charm, atmosphere and “another world” and from most areas you will find beautiful views of the bay. 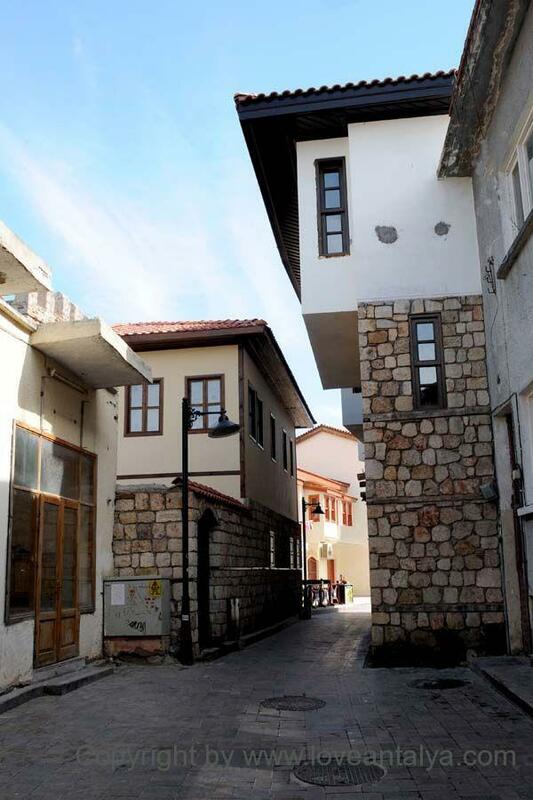 Fortunately, many of the old buildings are still well preserved and more and more being restored, since the turks have started to realize the value of their country and especially the city’s history. And thank God for that, because the atmosphere there is unique. If you envision long, narrow (and very steep) streets, beautiful half-timbered houses after the Ottoman and Greek style, streets often covered by flowering bougainvillea, several small parks and squares where you can sit and enjoy the food and the local tea or coffee , small fine boutique hotels and guesthouses, lots of restaurants and cafes, interesting shops and souvenir shops with everything from kelim and pillows, to the beautifully decorated porcelain from Kütahya, waterpipes, spices, copy clothes, jewelry and the famous amulet-eye that protects you against others “evil eye”. In other words you can find a bit of everything and the contrasts are great. I always visit two stores, when we are in Kaleici. 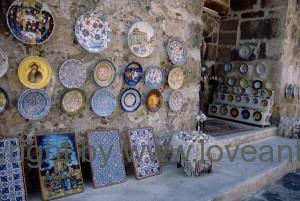 One is a nice shop filled with Kütahya porcelain that is so beautiful (and sometimes so expensive !!) that you almost do not dare but can not resist touching it (Kütahya, Turkey’s response to the royal porcelain). For me it is an exciting part of the countrys history, tradition and culture and I often come home with some small things. The second store I like to visit is a small, modest business at the beginning of the street, if you enter from Yivli Minare. 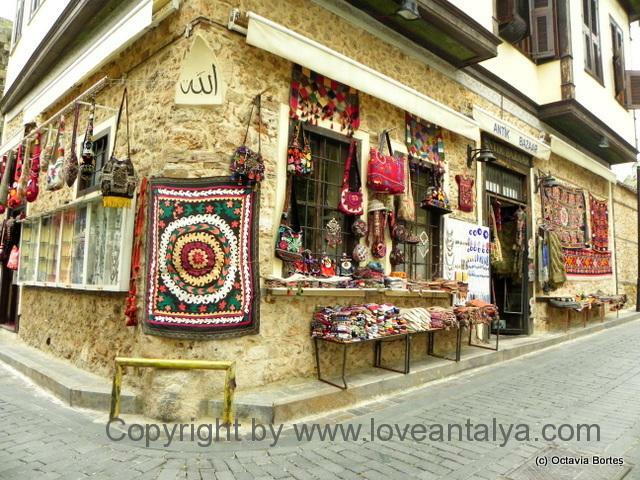 It is a small store that has the best picture and calligraphy of Ottoman scenes and Arabic quotations. I do not understand anything of the characters, but they are so beautiful and nice to look at. The images can be in many sizes and price ranges. You may be lucky to see some that are hundreds of years old and quite incredibly detailed, but others migt be completely new. I have never bought anything there, but I can not avoid having to pay a visit. The last 3 years I have not been inside the center, so I must certainly come this summer and I really hope that the stores are still there. If I’m lucky, then you can expect to see more pictures and addresses. There are many good reasons to take into Kaleici – one of them are the food! You will find an incredible collection of good cafes and small restaurants with more or less local food, but it is also possible to find larger or smaller restaurants with the finest gourmet and international food. 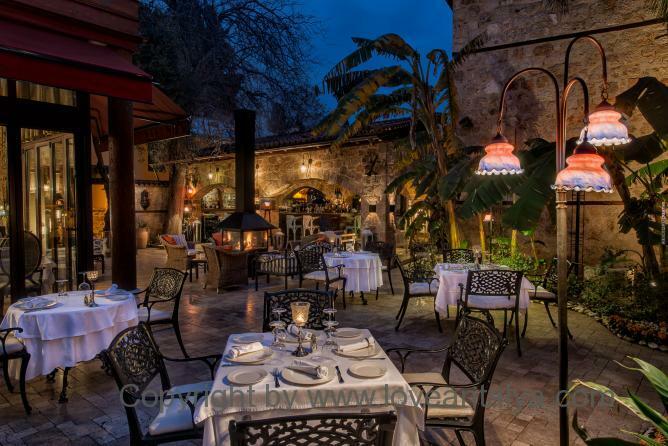 You will find many of these formidable restaurants at the small hotels, but you can easily walk in from the street. At the more popular ones, it is a good idea to book a table in advance. There is a reason why they are busy! But for all the world – do not fill you with “tourist food”. Try the authentic local Turkish food, which is so appreciated worldwide. You will not regret it. The waiters are like upside down to offer you the best of the best. And if you do not like what you get, just order something new, it’s not that expensive. You have to taste your way. I hope to give you a very good and comprehensive guide to good eating places, when we’ve been there for the summer. Just so you can be inspired. We not always visit Kaleici, when we’ve been in Antalya. This is partly because we always live outside of town, we often think that there are too hot in summer (Kaleici is surrounded by slopes, so there becomes unbearably hot when temp. rise), and finally we have been there so many times and can easily do without the crowds, tourist traps, traffic etc. But you are missing something important if you don’t go there – like a a bit of the charm and the original atmosphere is lacking. And I’m not been completely fair, because the politicians have in recent years made enormous efforts to improve the city center significantly. Incredibly many roads have been closed, so traffic has been significantly reduced (and it is EXPENSIVE to park in the center), roads have been unified, so it is easier (and less dangerous) to get around as a tourist. There is cleared tremendously in stores, shop owners, restaurants, etc., so it all appears a little more presentable, a little less cluttered and in everyone’s interest. There have also come regulations regarding building style and how to behave towards tourists. Hopefully you will experience a more friendly atmosphere from the sellers compared to other places. Of course you can not avoid that they are still trying to catch your eye (they gotta make money and have only about 5-6 months to earn the entire profit for the year), but this takes place in a not so intrusive and physical way wich especially Alanya unfortunately, is notorious for. Down by the old harbor, the waiters will seem a bit more eager. Just politely say no if you do not bother them or already have ate. They usually accept it. 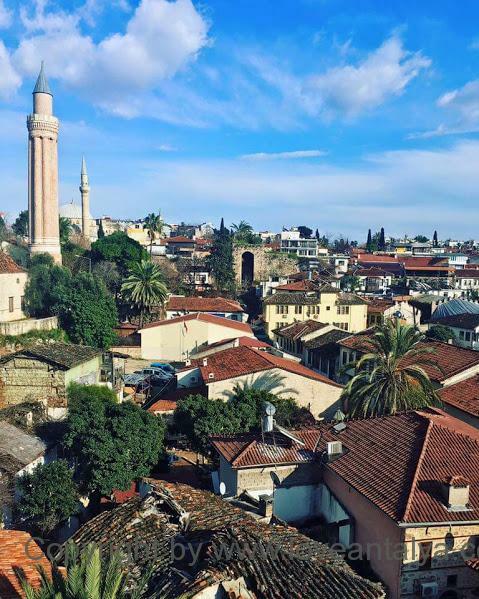 You can get in to Kaleici through several locations – the most popular is from the top of the hill at Yivli Minaret, or through the beautiful Hadrians Gate. No matter what, you will find yourself in the beautiful neighborhoods, that are characterized by the many sieges. Antalya is an ancient city founded by the Romans about 150 BC, but has since been under Byzantine, Seljuk, Ottoman and later Italian supremacy until the city again came at Turkish hands during the War of Independence in 1923. The actual development of the city only started after World War 2 and the modern development took its momentum in the 70s and later, for especially the last 10 years. It has obviously left its mark on the building style, the food and the people, but that’s great and you should not miss out on a trip up and down the picturesque streets. You can find a map of the most important places in Kaleici here. « Mermerli Beach – lyder herligt ik? ?